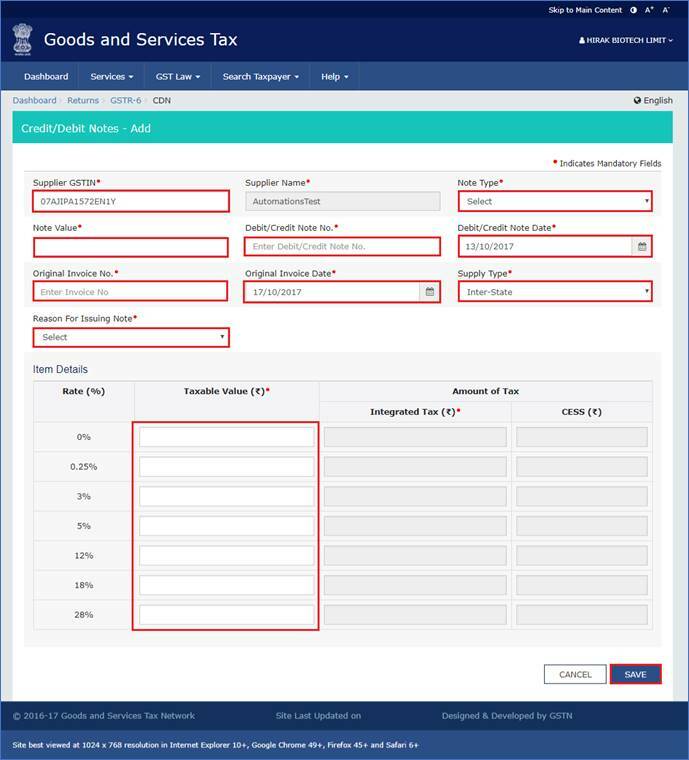 In the GSTR6 tile, click the PREPARE ONLINE button if you want to prepare the return by making entries on the GST Portal. Note: The due date for filing GSTR-6 is 13th of every month. Scroll down to the bottom of the GSTR-6 - Return for Input Service Distributor page and click the GENERATE GSTR6 SUMMARY button. The Details of auto drafted supplies of goods or services page is displayed. The Status should reflect as ‘Not Filed’. 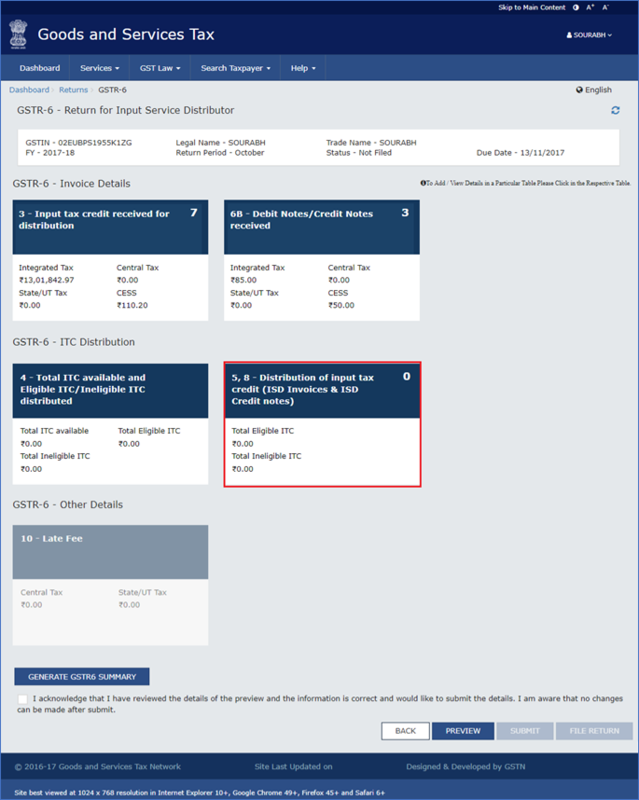 In case the Status is ‘Filed’, GSTR-6 for the same month/tax period cannot be filed. 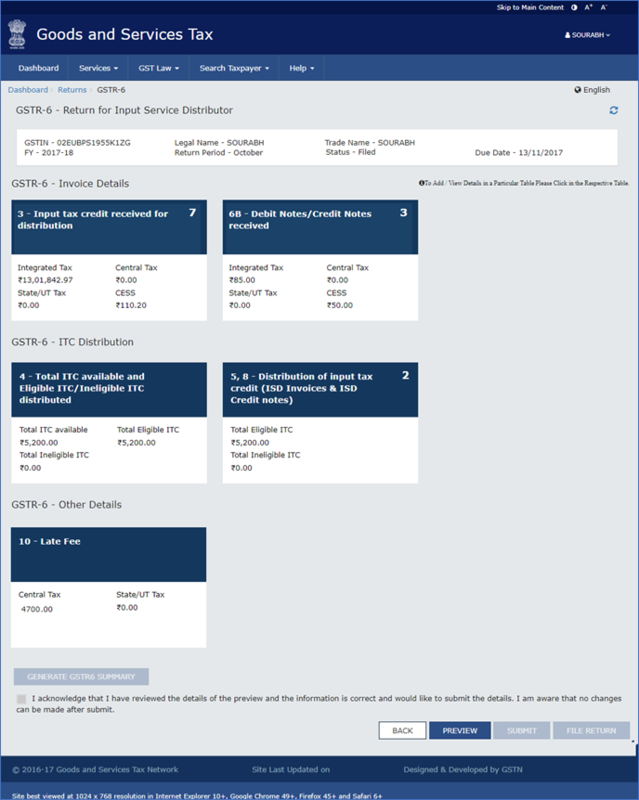 User needs to explicitly hit on the GENERATE GSTR6 SUMMARY button at the bottom of the page, then only auto drafted items will be visible. A confirmation message is displayed at the top of the page. You can check the status in some time. 1. 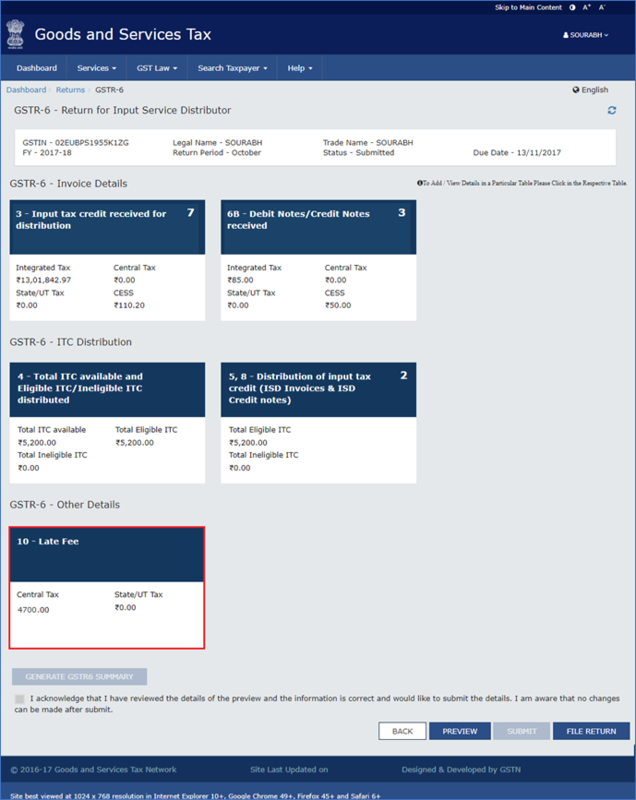 To view or edit details of input tax credit received for distribution, click the 3-Input tax credit received for distribution tile. 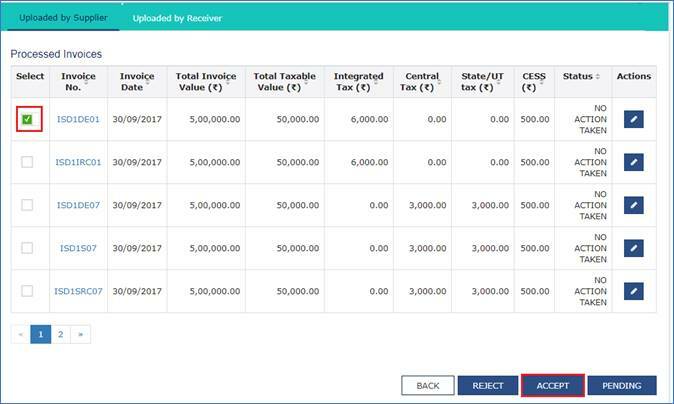 You can either edit, accept, delete or keep the invoices in pending state, which are added by the supplier. Note: You can change status of the invoice from accept, reject, pending any number of times till submission. 2. Click the Supplier's GSTIN link under Supplier Details column and you will see a list of invoice line items under the “Uploaded by Supplier” tab. 4. Edit the invoice details and click the SAVE button. 5. You will be directed to the previous page and a message is displayed that invoice is modified and status changes to MODIFIED. Invoices marked as Modified would reflect in supplier GSTR-1/1A upon filing of GSTR-6 for acceptance, rejection or keep pending the modifications made by you. 3. Select the checkbox for the invoice and click the ACCEPT button. A success message is displayed that the invoice is accepted and status changes to ACCEPTED. 3. Select the checkbox for the invoice and click the REJECT button. 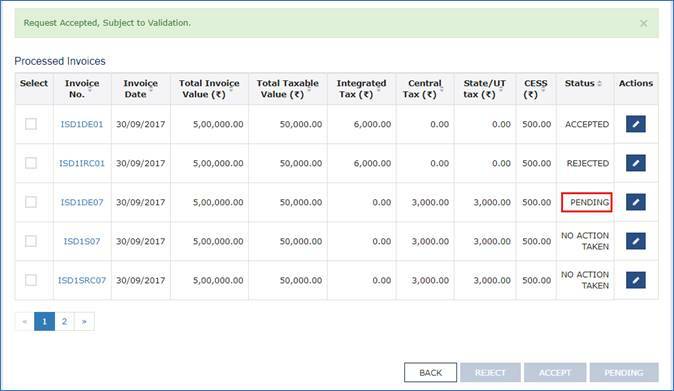 A success message is displayed that the invoice is rejected and status changes to REJECTED. 3. Select the checkbox for the invoice and click the PENDING button. 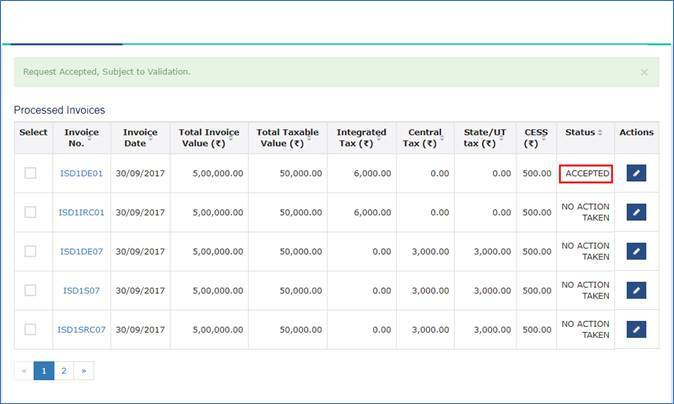 A success message is displayed that the invoice is in pending state and status changes to PENDING. You can take action on this invoice in next tax periods. 2. In case, some invoices have been missed by the registered suppliers, you can add them here. Click the ADD MISSING INVOICE DETAILS button to add the missing invoices. 3. The B2B-Add Invoice page is displayed. In the Supplier’s GSTIN field, enter the GSTIN of the supplier who supplied the goods or services. As you enter the supplier's GSTIN, Supplier's name is auto-populated and screen is expanded below displaying the item-details. 4. In the Invoice No. field, enter the invoice number. 5. In the Invoice Date field, select the date on which the invoice was generated using the calendar. 6. In the POS field, select the place of supply where the supplies were delivered. Based on the state selected in POS, Supply Type field is auto-populated. Note: GST Portal would determine whether it is an Interstate or Intrastate transaction based on the state where GSTIN of Supplier is registered and state that has been selected in POS field. 7. 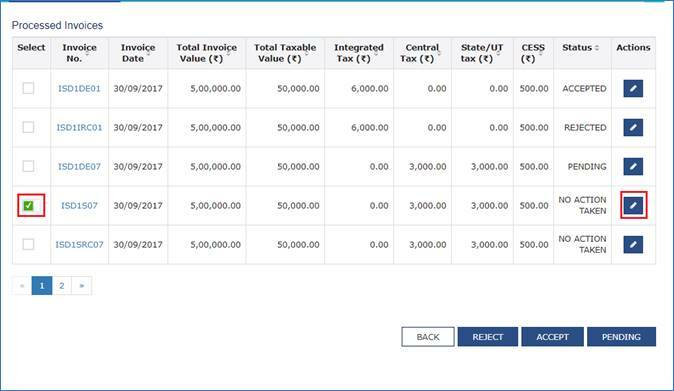 In the Total Invoice Value field, enter the total value of invoice for which the goods or services are received. You will be directed to the previous page and a message is displayed that invoice is added. 8. Click the Supplier's GSTIN link under Supplier Details column. 11. Click the Uploaded by Receiver tab. The missing invoice is added. 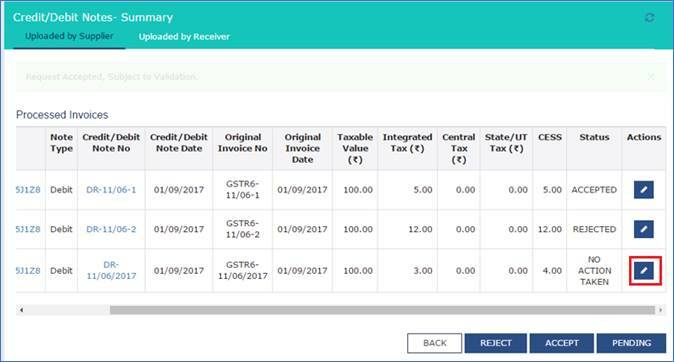 Here, you can also edit/delete the added invoices (under Actions) till the GSTR-6 is submitted. 12. 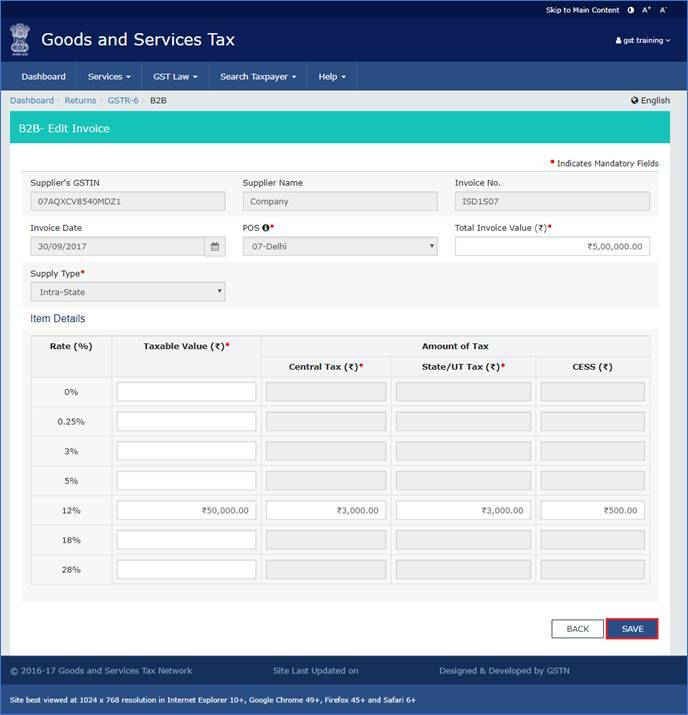 Click the BACK button to go back to the GSTR-6 landing page. 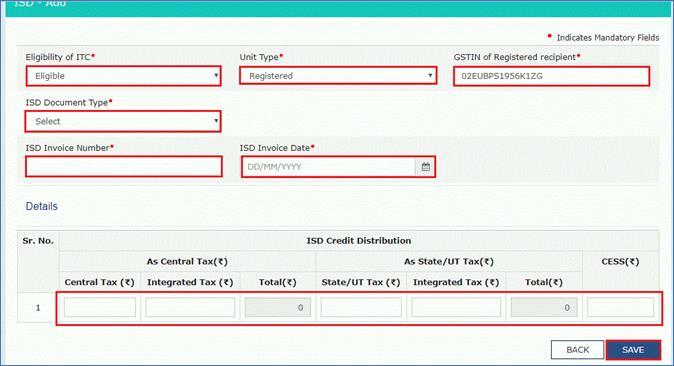 The 3-Input tax credit received for distribution tile in GSTR-6 will reflect the number of invoices added. Please click the refresh button ( ) on the top of the screen to ensure quick updating of the summary on the tile. 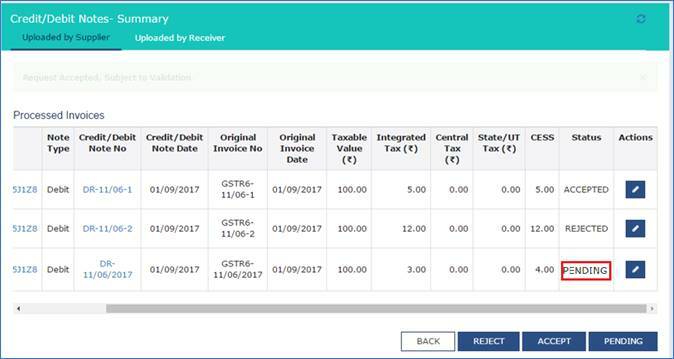 Once the missing invoice is added, this gets reflected in GSTR-1/1A of the supplier for action on the invoices. 1. To view or edit details of debit or credit notes received, click the 6B - Debit Notes/ Credit Notes Received tile. 3. In the Credit/Debit Notes - Supplier Details page, click the ADD CREDIT NOTE/DEBIT NOTE button to add a new invoice. 4. In the Supplier GSTIN field, enter the name of the supplier. 5. From the Note Type drop-down list, select whether the details added are for a Debit or Credit Note or Refund voucher. 6. In the Note Value field, enter the value of the note or refund voucher. 8. In the Debit/Credit Note Date field, select the date on which the debit or credit Note was issued using the calendar. 9. In the Original Invoice No. field, enter the invoice number of the earlier filed invoice (original invoice) on which the Debit or Credit Note is being issued or the number of advance receipt against which the refund voucher is issued. 10. In the Original Invoice Date field, select the original invoice date using the calendar. 11. 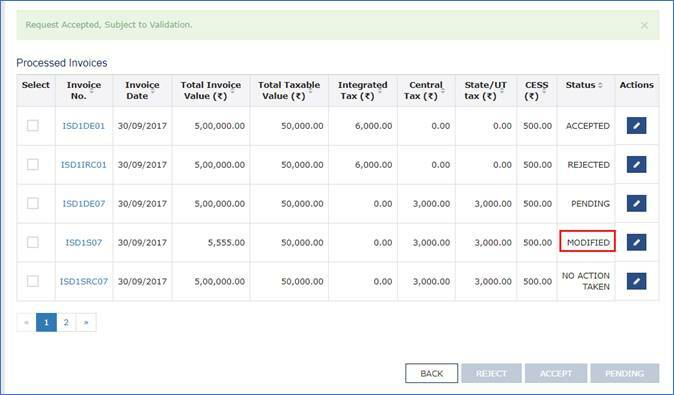 From the Supply Type drop-down list, select whether the note or voucher is added for an invoice of Inter-state or Intra-state transaction. 12. From the Reason for Issuing Note drop-down list, select the reason on account of which the debit or credit note is issued. b) In the Amount of Tax field against the rates, enter the amount of tax of the goods or services. d) Click the SAVE button to save the note details. In case Place of Supply (POS) is different from the state of the supplier, transaction becomes an Inter-State transaction. The supplier has to select the inter-state supply type for adding missing credit/debit notes related to such supplies. 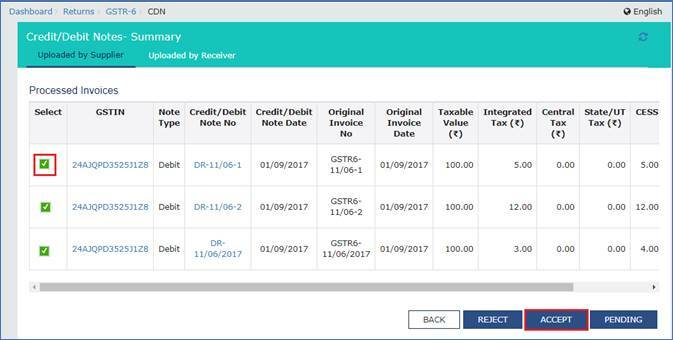 The 6B - Debit Notes/ Credit Notes Received tile in GSTR-6 will reflect the number of invoices added. Please click the refresh button ( ) on the top of the screen to ensure quick updating of the summary on the tile. 1. 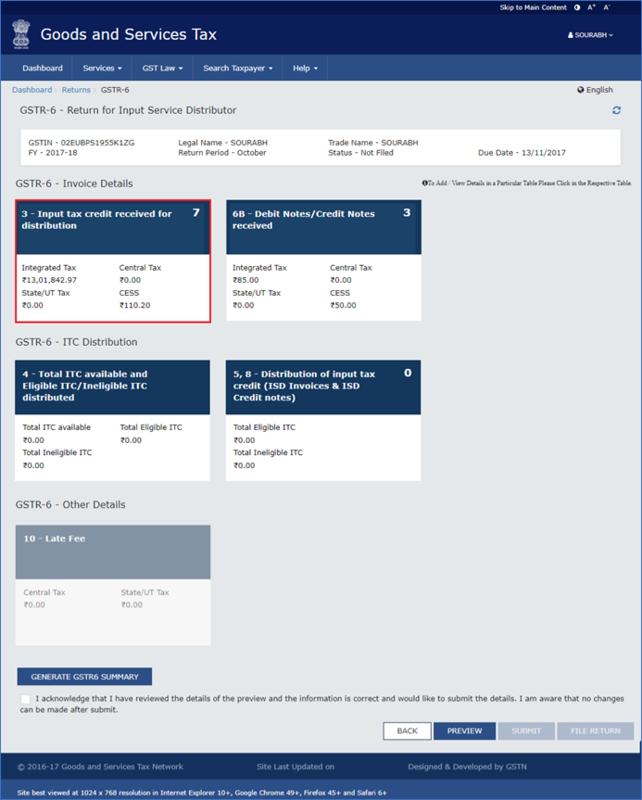 To view or edit details of distribution of input tax credit for ISD invoices and ISD Credit notes, click the 5, 8 - Distribution of input tax credit (ISD Invoices & ISD Credit notes) tile. 2. Click the ADD DOCUMENT button. 3. 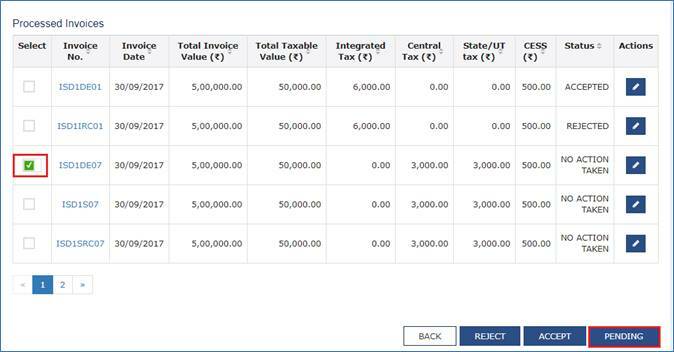 Select the Eligibility of ITC from the drop-down list. 4. Select the Unit Type from the drop-down list. 5. Enter the GSTIN of registered recipient. 6. Select the ISD Document Type from the drop-down list. 7. In the ISD Invoice Number field, enter the ISD invoice number. 8. Select the ISD Invoice Date using the calendar. 9. In the ISD Credit Distribution section, enter the Integrated Tax, Central Tax, State/UT Tax and Cess. If the recipient unit is within State, the distributed credit is CGST and SGST and the following entry screen will appear in which the details have to be entered. 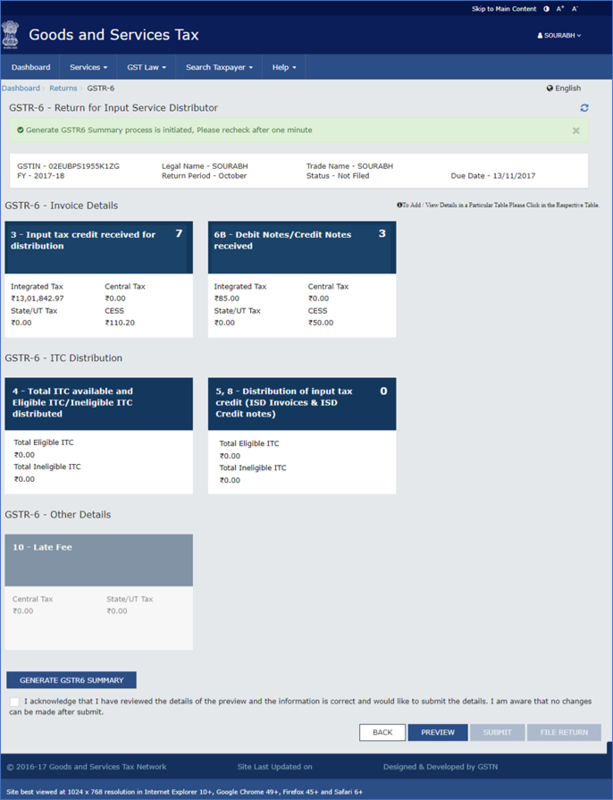 If the recipient unit belongs to another state, the distributed credit is IGST and the following screen is displayed in which the details have to be furnished. 7. 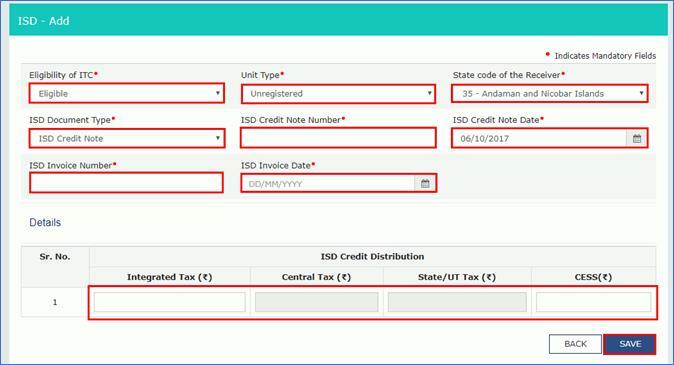 In the ISD Credit Note Number field, enter the ISD credit note number. 8. 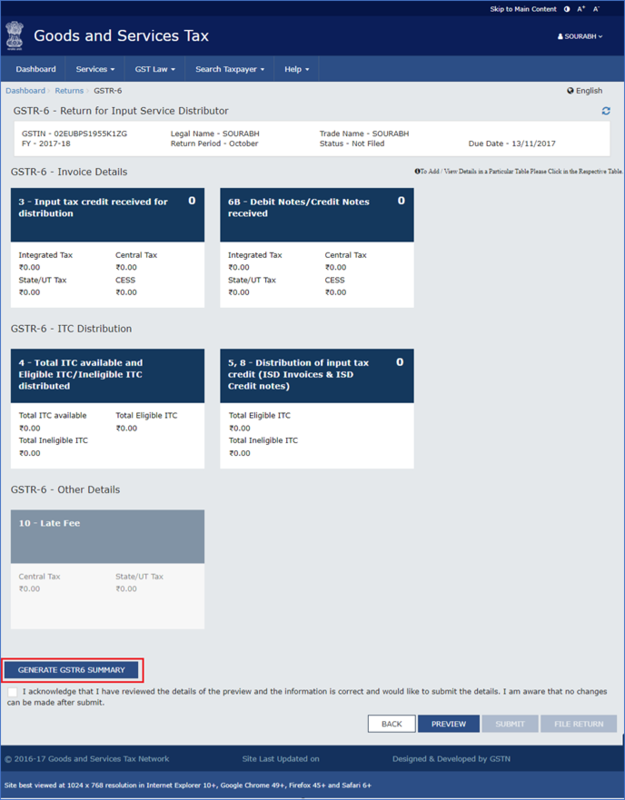 Select the ISD Credit Note Date using the calendar. 9. In the ISD Invoice Number field, enter the ISD invoice number. 10. Select the ISD Invoice Date using the calendar. 11. 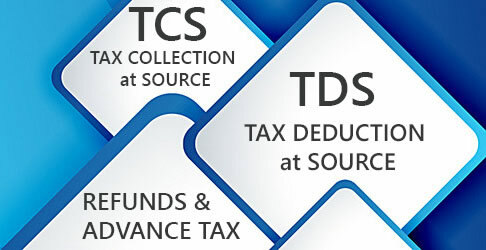 In the ISD Credit Distribution section, enter the Integrated Tax and Cess. 12. Click the SAVE button. 5. Enter the State Code of the receiver. You will be directed to the previous page and invoice is added under Processed Invoices under Eligible ITC tab. 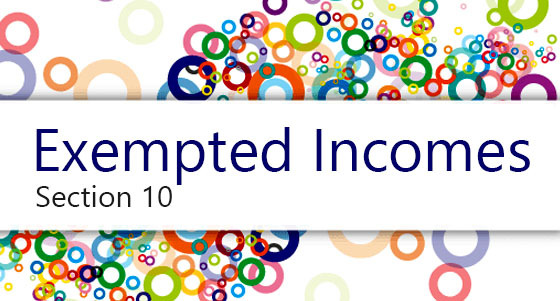 Similarly, you need to add the details for Ineligible ITC and this will be reflected under Ineligible ITC tab. 1. To view details of Total ITC available and Eligible ITC/Ineligible ITC distributed, click the 4 - Total ITC available and Eligible ITC/Ineligible ITC distributed tile. 2. Click the CALCULATE ITC button. 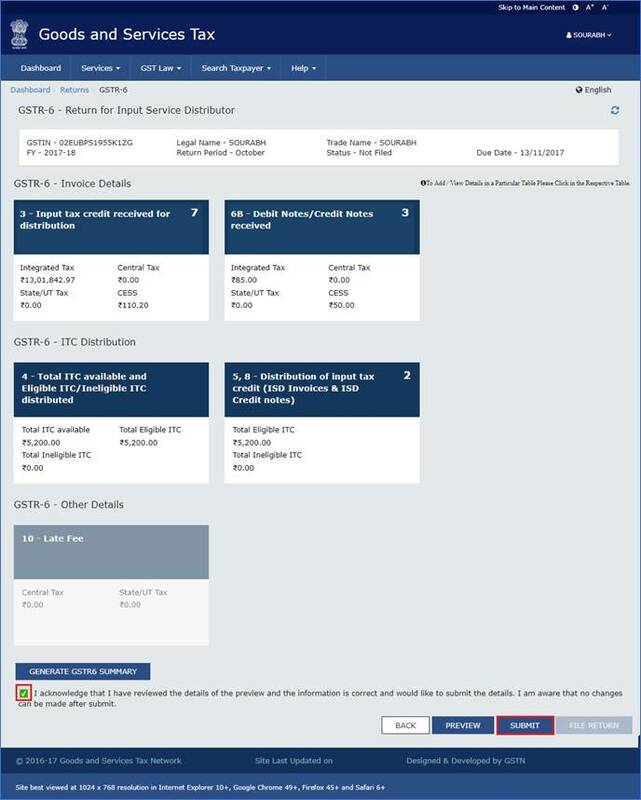 The Total ITC available for distribution, Amount of Eligible ITC and Amount of ineligible ITC is displayed. Once you have entered all the details, click the PREVIEW button. This button will download the draft Summary page of your GSTR-6 for your review. 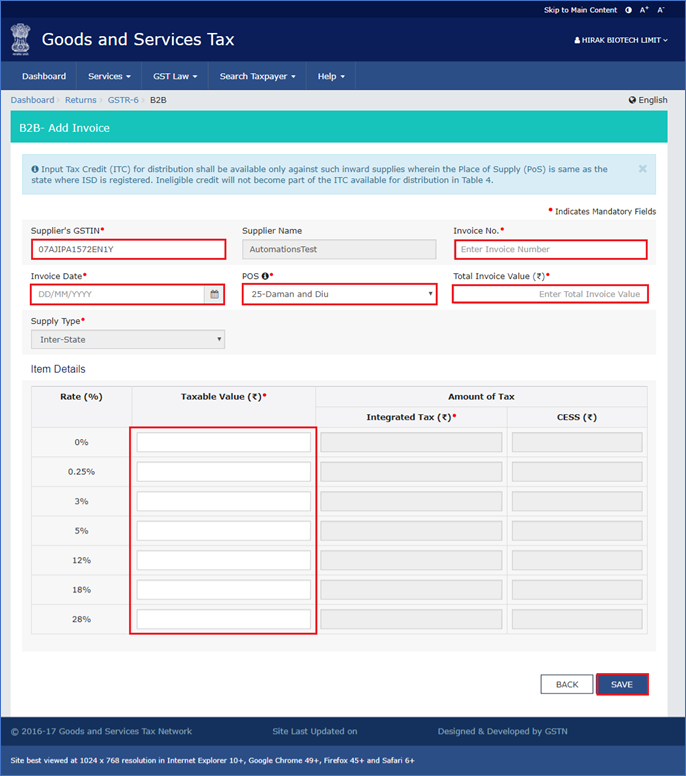 It is recommended that you download this Summary page and review the summary of entries made in different sections with patience before submitting the GSTR-6. The PDF file generated would bear watermark of draft as the details are yet to be submitted. 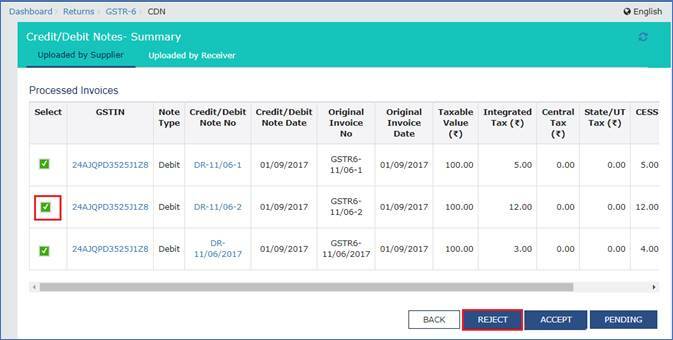 Note: The submit button will freeze the invoices uploaded in the GSTR-6 for that particular month. 1. Select the acknowledgement checkbox stating that you have reviewed the details of preview and the information furnished is correct and you are aware that no changes can be made after submit. Once you click the acknowledgement, the SUBMIT button will be enabled. 2. Click the SUBMIT button in the landing page to submit GSTR-6. 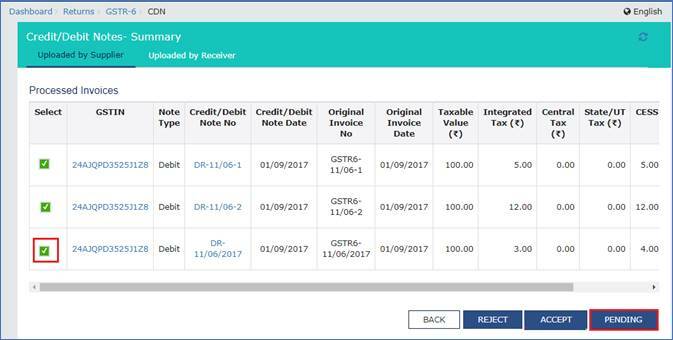 The submit button will freeze the invoices uploaded in the GSTR-6 for that particular month. You will be not able to upload any further invoices for that month. 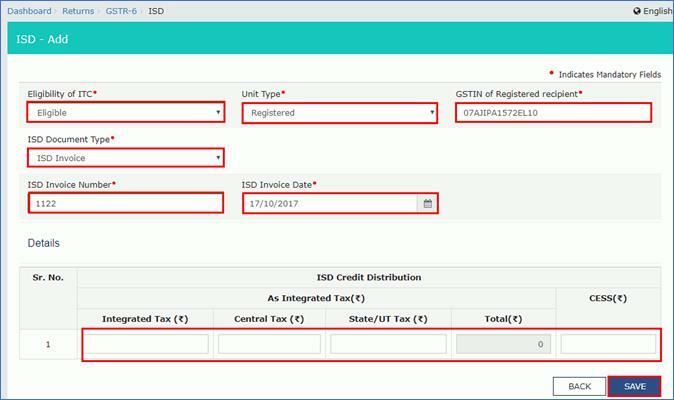 In case you have missed adding any invoice, you can upload those invoices in the next month or you can wait for supplier to add it in supplier GSTR-1. 3. Click the PROCEED button. 4. A success message is displayed at the top of the page. Once you submit the data, data is frozen and you cannot change any fields. Refresh the page. 5. 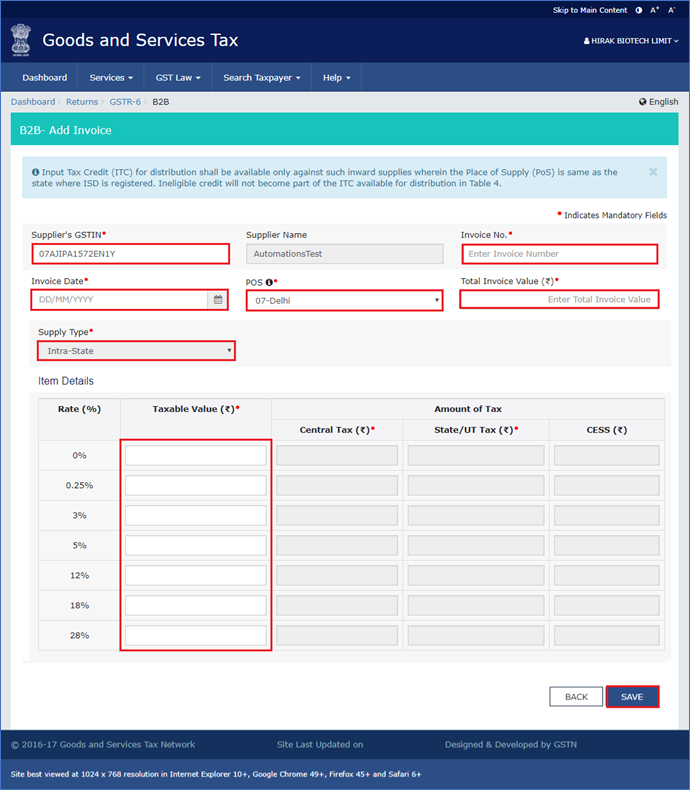 Refresh the page and the status of GSTR-6 changes to Submitted after the submission of GSTR-6. 6. 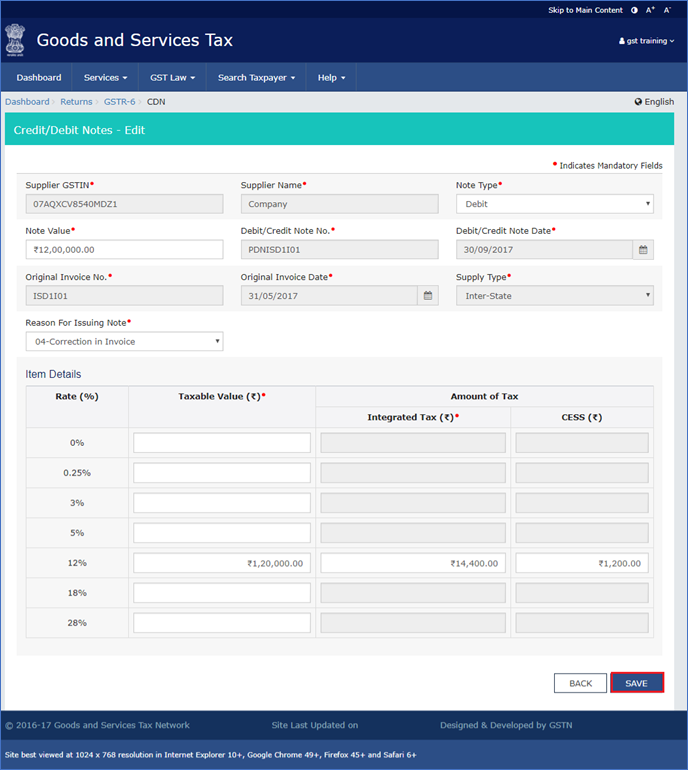 Click the PREVIEW button again, to download the submitted GSTR-6 in PDF format. 1. Once you submit GSTR-6, 10 - Late Fee tile gets enabled. To view details of late fee, click the 10 - Late Fee tile. 2. Click the OFFSET LATEFEE button. Late fee is offset and debit number is displayed. 1. Click the FILE RETURN button. 2. 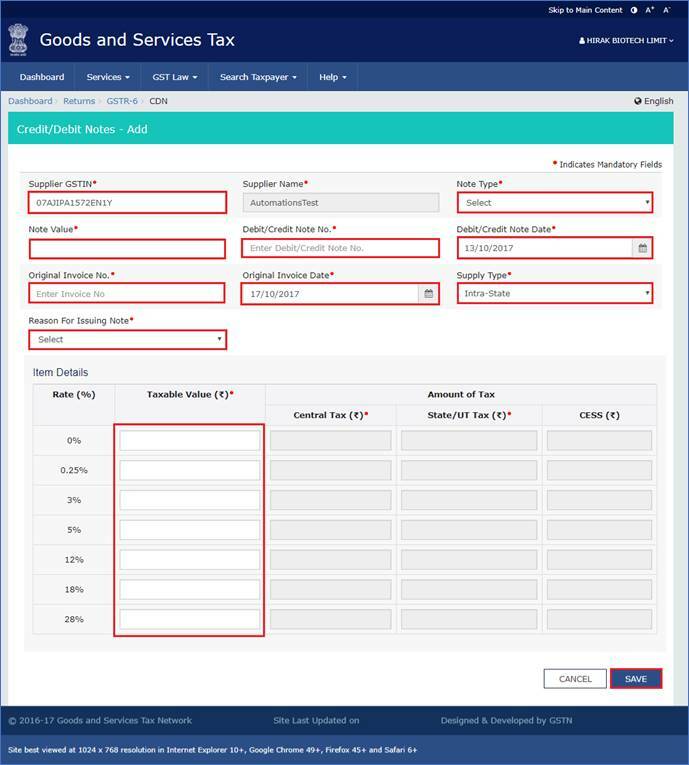 The Returns Filing for GSTR6 page is displayed. Select the Declaration checkbox. 3. In the Authorised Signatory drop-down list, select the authorized signatory. This will enable the two buttons - FILE WITH DSC or FILE WITH EVC. 4. 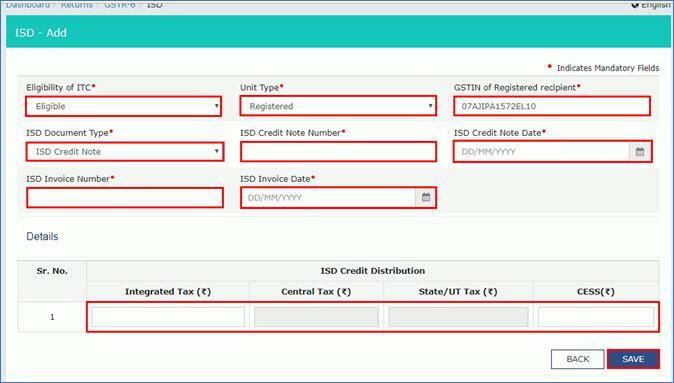 Click the FILE WITH DSC or FILE WITH EVC button to file Table 6A of FORM GSTR1. Note: On filing of the GSTR6, notification through e-mail and SMS is sent to the Authorized Signatory. The status of GSTR-6 changes to Filed. Note: On filing of the GSTR-6, notification through e-mail and SMS is sent to the Authorized Signatory. 1. The File Returns page is displayed. Select the Financial Year & Return Filing Period (Month) for which you want to view the return from the drop-down list. 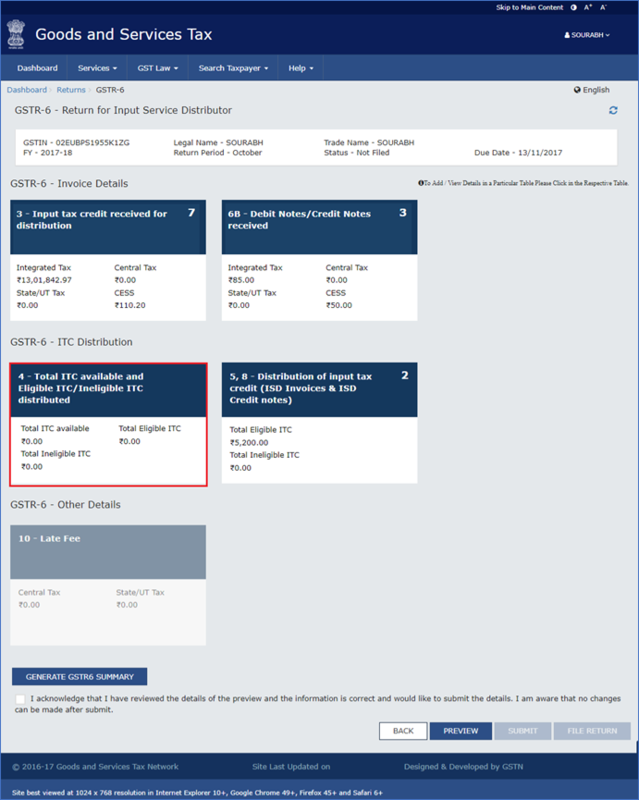 Status of the GSTR-6 return changes to "Filed".